Sitting in the Denver airport last week waiting for my flight home, I noticed a handy passenger-communication system called visual paging. 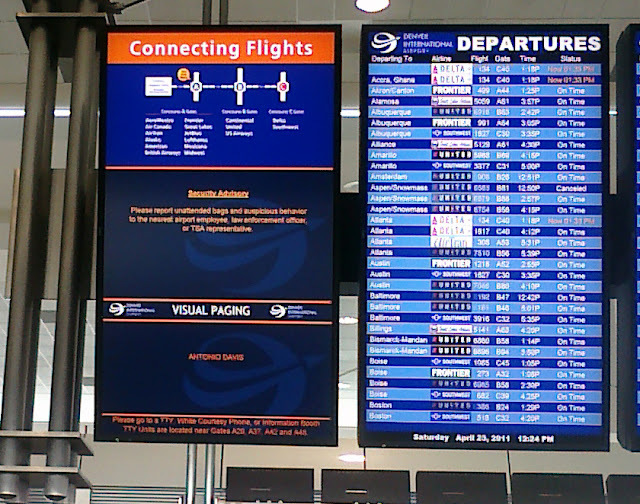 There was a screen next to the arrivals and departures monitor that had the name of a passenger who was being paged, so that if you didn't hear the page over the loudspeaker, you could see on the screen who was being called. Seems like a great idea, huh? It's frequently difficult to hear pages in airports, especially large airports with gate announcements happening simultaneously. Anything to help the passenger get their pages and work out their travel issues, right? However, there's something wrong with this system. Can you tell what it is by looking at the picture? In case you can't read the name of the person being paged, it's Antonio Davis. Now, if I want to look at the departures monitor, I'll walk over and check it out, because that's what I'm trained to do as a passenger. But I believe this visual paging system is supposed to be visible from afar -- say, from the gate, where I was sitting. Nope. You have to walk right up to this thing to read it. And do you see how much extra space there is around the name? This font could be five times bigger and still not take up much of the screen. I would also argue that there's not enough contrast between the text and the background, making the name even harder to see. What does this remind me of? PowerPoint with text so tiny that your audience can't even read it. Usually, this happens because the speaker is trying to cram in lots of data and makes the text tiny so it will all fit. Which is never a good excuse. But in this instance, there isn't even a lot of data to cram onto the screen. Even if several names were being paged, they still could make this bigger and easier to see. To use a popular Twitter expression: Visual Paging FAIL.